The most meaningful thing you can do for your boss is to truly thank him/her for everything he/she has done for you. Write an email, buy a card, either way, a simple “Thank you for everything” will mean a lot to your boss. Does your boss have a favorite lunch spot? Get your coworkers together and treat him/her to lunch! This is a great way to celebrate your boss, because you will spend time and get to know your boss better outside of the office, which will ultimately help you build a better relationship with him/her. Have an additional Boss’s Day idea to share? Leave a comment! 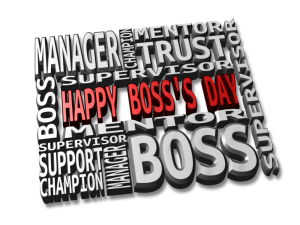 Happy Boss’s Day to all supervisors, managers and executives of all levels! This entry was posted in Currently Employed and tagged Boss's Day, Boss's Day Ideas, Celebrate your Boss, Gift Ideas for Boss, Happy Boss's Day. Bookmark the permalink.